(348/26 ptn) 201-211 Golden Gate Avenue, film exchange. Two stories; reinforced concrete structure; Corinthian pilaster order, cast masks in frieze; temple front composition; Renaissance/Baroque ornamentation; alterations: windows, entry, spandrels remodeled. Original owner: Louis R. Lurie. Architect: Albert Schroepfer. 1920. (348/26 ptn) 213 Golden Gate Avenue, film exchange. One story; reinforced concrete structure; pilaster order, arches, cast masks in frieze; arcaded block composition; Renaissance/Baroque ornamentation; alterations: windows remodeled. Original owner: Louis R. Lurie. Architect: Albert Schroepfer (attributed). 1920. (348/26 ptn) 215-229 Golden Gate Avenue, film exchange. One story; reinforced concrete structure; pilaster order, arches, cast masks in frieze; arcaded block composition; Renaissance/Baroque ornamentation; alterations: windows remodeled. Original owner: Louis R. Lurie. Architect: Albert Schroepfer (attributed). 1920. (348/24) 241-243 Golden Gate Avenue, film exchange. One story; brick structure; Corinthian pilaster order; enframed window wall composition; Renaissance/Baroque ornamentation; signs: frieze with surviving letters “OR”; alterations: cornice removed, storefront partly altered. Original owner: Emory M. Frazier. Architect unknown. 1916. (348/23) 247 Golden Gate Avenue, film exchange. One story; brick structure; arch framed by pilaster order; one-part vault composition; Renaissance/Baroque ornamentation; alterations: cornice removed, storefront partly remodeled. Original owner: Mrs. Alice G. Coffin. Architect unknown. 1911. (348/17) 255 Golden Gate Avenue, Ayse Manyas Kenmore Center, sales room and offices. One story; brick structure; Corinthian order with arches in bays; temple front composition; Renaissance/Baroque ornamentation; alterations: aluminum windows, vestibule and doorway altered. Original owner: Edward McDevitt. Architect: Reid Brothers. 1916. Beginning with the motion-sequence experiments of Eadweard Muybridge and his invention of the zoöpraxiscope* in 1879, San Francisco has been a center of independent film making, distinguished by innovation in all areas of the film industry. In the early years of the cinema, movie theaters had to buy the films they showed from the studios. Film distribution was revolutionized in 1902 by a trio of entrepreneurial, movie-making siblings named the Miles Brothers. By purchasing films from the studios and renting them to theaters, they established the first centralized film exchange; the equivalent of a lending library for movie theaters. Many early film exchanges were located in Tenderloin buildings because of their proximity to Market Street cinemas; however, nitrate film† was explosively volatile, so ordinary buildings were dangerous places in which to store movies, especially large quantities of them. 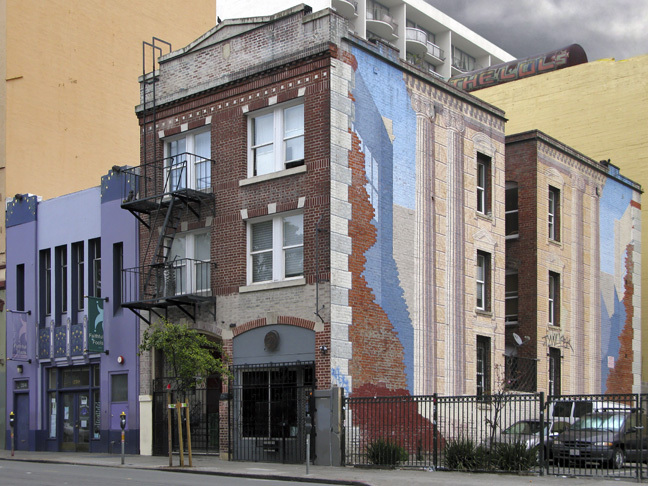 Although delayed by political inertia, the ’06 conflagration notwithstanding, by 1911 was born the first of the Tenderloin’s many film exchange buildings—fireproof, reinforced concrete structures specifically designed for storing film. (346/3B) 125 Hyde Street, film exchange (later Monaco Labs). Architect: Andrew H. Knoll. 1931. (346/3) 129 Hyde Street, film exchange. Architect: unknown. 1930. (346/2) 135-145 Hyde Street, garage. Architect: unknown. 1920. (346/1) 147-161 Hyde Street, Princess Apartments. Architect: H.C. Baumann. 1926. (336/3) 400 Turk Street, Turk and Hyde Mini Park. (336/2) 225-229 Hyde Street, Cosmopolitan Apartments. Architect: unknown. 1927. (336/19, ptn 18) 245-251 Hyde Street; Fox Film Corporation and RKO (1932); Gaumont British Picture Corporation of America and 20th Century Fox Film Corporation (1937); film exchange; Wally Heider Studios, later Hyde Street Studios (behind trees in photo). Two stories; reinforced concrete strucuture; stucco facade, cast ornament, steel windows, fluted piers, decorative panels, bell-curve lintel, stepped parapet; two parallel facades; Moderne style. Alterations: storefront windows filled in. Owners Bell Brothers (1930), Frank and Ida Onorato (1947). Architects: O’Brien Brothers and W.D. Peugh. 1931. (336/17, ptn. 18) 255-259 Hyde Street. 20th Century Fox, Metro-Goldwyn-Mayer Distributing Corporation, Loews, and United Artists (1937); film exchange. Two stories; reinforced concrete with steel windows; cast ornament including lion heads (MGM), tragic and comic masks; composition of two parallel facades; Moderne ornamentation. Alterations: ground floor bays filled in. 245-251 and 255-259 Hyde were built on a single lot as two separate buildings each with two facades, and subdivided after 1947 into three lots that don’t appear to correspond to the footprints of the two buildings. Owners: Bell Brothers (1930), Frank & Ida Onorato (1947). Architects: O’Brien Brothers and W.D. Peugh. 1930. 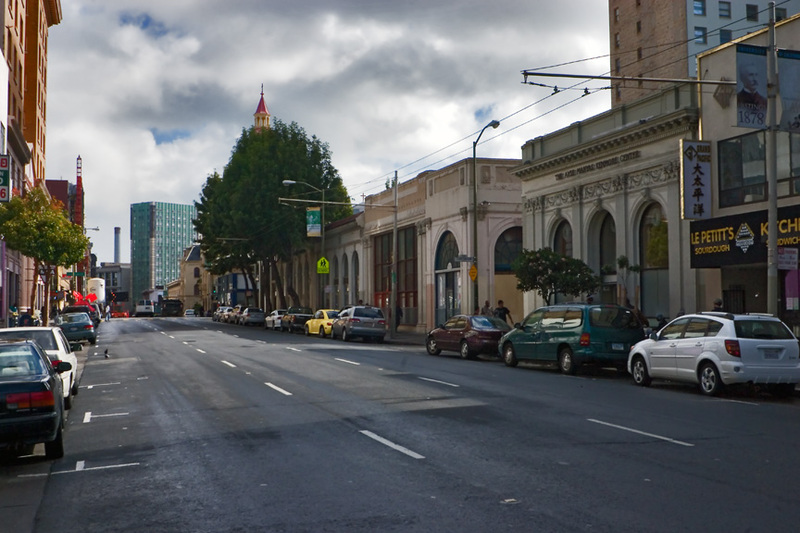 Until the end of the 1980s, businesses along this stretch of Hyde Street and around the corner on Golden Gate Avenue included Wally Heider Studios (now Hyde Street Studios), Monaco Labs and Leo Diner Films—a recording studio and motion picture labs/post-production facilities that, with the advent of acetate-based Kodacolor and black-and-white reversal motion picture film in the early 1950s, had taken over film exchange buildings. Among the notables who recorded albums at Wally Heider’s were the Jefferson Airplane, Grateful Dead, Creedence Clearwater Revival, and Crosby, Stills, Nash and Young. 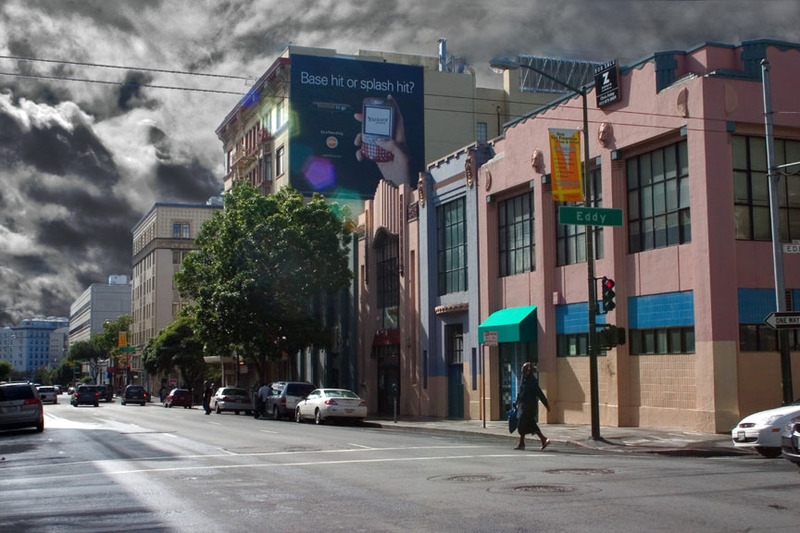 As one who was involved in San Francisco’s underground filmmaking scene from the late 1960s through the mid-80s, these buildings played a part in my own history. Wally Heider Studios was where I recorded the score to Thundercrack! * in 1975, and Leo Diner Films was where that film and many others on which I worked were processed and printed. In ’78 and ’79, I was the sound engineer for Diner Films. (349/10A) 177-191 Golden Gate Avenue. Film exchange converted to commercial. 2B stories; reinforced concrete structure; brick facade, tile inlay, galvanized iron cornice, stepped parapet; one-part commercial composition; Renaissance/Baroque ornamentation; storefronts: display windows with vestibules; alterations: storefronts partly altered. Owner and architect unknown. 1916. (344/3) 134 Golden Gate Avenue. Lofts for film exchange. 3B stories; brick structure; arches, cast masks in frieze, cornice; composition: arcaded block; Renaissance/Baroque ornamentation; alterations: ground floor windows of bays remodeled. Original owners: Sperry Land Company. Architect: Weeks and Day. 1917. 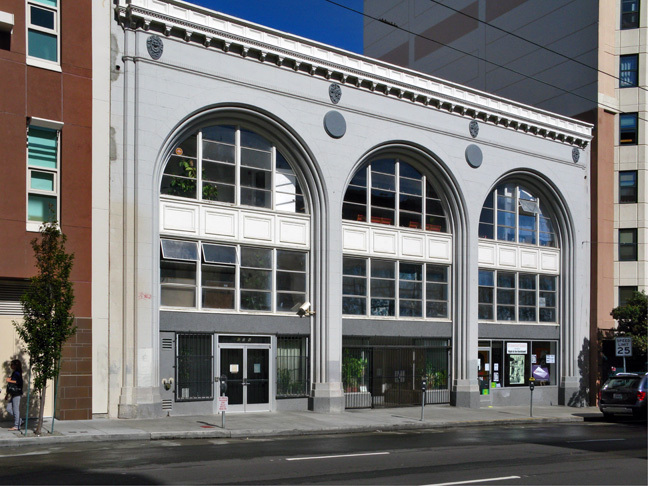 Current occupants are a mental health outpatient clinic on the upper floors and the North of Market/Tenderloin Community Benefit District. (344/6A) 146-150 Leavenworth Street. Hospitality House, Community Arts Studio and Gallery; film exchange; 3B stories; reinforced concrete structure; cast ornament on band around facade, cornice; enframed window wall composition; Renaissance/Baroque ornamentation; alterations: security gate and grilles, vestibule. Original owner: George E. Bennett. Engineer: L.H. Nishkian. 1922. Hospitality House is a film exchange converted to an open art studio and gallery that serves both the neighborhood’s dispossessed and residents of SROs. Anyone wishing to explore self-expression in nearly any medium, but lacking means to buy materials or a studio in which to work is welcome there.